The road to Ajloun, located 25 kilometers west of Jerash and 73 kilometers from Amman, winds through fertile green hillsides lined with olive groves. The main attraction in Ajloun is the stronghold of Qalaat al-Rabadh, a fine example of medieval Arab/Islamic military architecture. The castle was built between 1184-85 CE by the nephew of Salah Eddin al-Ayyubi (known in the West as Saladin), the great Muslim commander who waged a successful campaign to recover lands lost to the invading Crusaders. Ajlouns strategic position commanding the Jordan Valley, as well as the three small valleys leading to it, made it an important link in the defensive chain against the Crusaders, who spent decades unsuccessfully trying to capture the castle and nearby village. The fortress is built upon the apex of the hill above Ajloun, and offers a breathtaking view of the surrounding countryside. On a clear day you can see the Dead Sea, the Jordan Valley, the West Bank, and Lake Tiberias (the Sea of Galilee). The original fortress had four corner towers, with arrow slits and a 16-meter-wide moat. It was enlarged in 1214-15 CE by the Mamluk officer Aibak ibn Abdullah, who added a new tower in the southeast corner and constructed the main one. 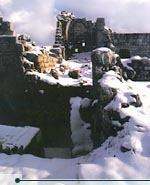 In 1229, the castle fell to the Emirate of Karak. In 1260, it was largely destroyed by the Mongol invaders, but was reconquered and rebuilt almost immediately by the Mamluk Sultan Baybars. The southwest tower was constructed at that time. During Mamluk times, Qalaat al-Rabadh was one in a network of beacons and pigeon posts that allowed messages to be transmitted from Baghdad to Cairo in only twelve hours! Entrance is free to the castle, which is open seven days a week during daylight hours. Forty minutes north of Ajloun (88 kilometers from Amman), the bustling city of Irbid is an excellent staging point for excursions to Umm Qais, Pella and other sites in northern Jordan. Irbids importance as a trading center with Haifa ended in 1948, but in recent years it has gained importance as the industrial center and administrative capital of the north. The city has a good selection of restaurants, a number of banks and hotels, and the campus of Yarmouk University. Artifacts and graves in the area show that Irbid has been inhabited since the Bronze Age. Scholars have debated whether Irbid is the biblical site of Beth Arbel, or Beit Arbil in Arabic. Under Roman rule, the city was renamed Arbila. While most of this heritage is hidden beneath the new city of Irbid, there are two excellent museums located within Yarmouk University. The Museum of Jordanian Heritage is considered the finest archeological museum in the country, while the Natural History Museum is also worth a visit. Both museums are open from 10:00-17:00 in winter (15:00 in summer) every day except Tuesday. The modern town of Umm Qais is the site of the ancient Greco-Roman town of Gadara, one of the cities of the Decapolis and, according to the Bible, the place where Jesus cast out the devil from two men into a herd of pigs (Matthew 8: 28-34). Rising 518 meters above sea level with views of Lake Tiberias and the Golan Heights, there is no better vantage point in northern Jordan than Umm Qais. Gadara was renowned for its cosmopolitan atmosphere, attracting an array of writers, artists, philosophers and poets. 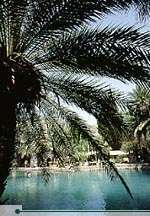 It also served as a resort for Romans vacationing in the nearby al-Hemma hot springs. Like Pella, its sister Decapolis city, Gadara was blessed with fertile soil, abundant water, and a location astride a number of key trading routes connecting Asia and Europe. The city was probably founded by the Greeks during the fourth century BCE. Gadara was overrun by the Seleucid ruler Antiochus III in 218 BCE. When the Romans under Pompey conquered the East and formed the Decapolis, the fortunes of Gadara, taken in 63 BCE, improved rapidly and building was undertaken on a large scale. During the early part of Roman rule, the Nabateans (with their capital at Petra) controlled the trade routes as far north as Damascus. Aiming to put an end to this competition, Mark Antony sent King Herod the Great to weaken the Nabateans, who finally gave up their northern interests in 31 BCE. In appreciation for his efforts, Rome rewarded Herod with Gadara. The city remained under Herods rule until his death, and then reverted to semi-autonomy as part of the Roman province of Syria. The Byzantine era witnessed the decline of Gadara into relative obscurity. Earthquakes destroyed many buildings, and by the dawn of the Islamic era Gadara had become just another village. 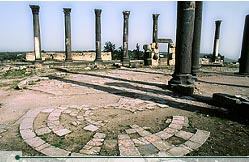 The town became known by the Arabic Umm Qais during the Middle Ages. Today, a considerable portion of the original Roman amphitheater has survived. The seats face west, and are brought to life at sunset. Covered passageways stand in the back, and until recently, a six-foot headless white marble goddess sat at the foot of one of the amphitheaters internal staircases. The statuethought to be of Tyche, the patron goddess of Gadaracan now be seen in Umm Qais archeological museum. The museum, which also houses a Byzantine mosaic frieze and a marble sarcophagus, is open from 08:00-17:00 in summer, and in winter from 08:00-16:00, every day except Tuesday. No charge is required. Next to the theater is a colonnaded street that was once probably the towns commercial center. Also near the black basalt theater are the columns of the great Basilica of Gadara. Further west along the colonnaded street are a mausoleum and public baths. After a few hundred meters you can barely make out the remains of what once was a hippodrome. Meals are available in Umm Qais, but as yet there is no overnight accommodation. This should not present a problem, however, as the city is only 30 kilometers northwest of Irbid and 120 kilometers from Amman. Ten kilometers to the north, the road from Umm Qais winds down toward the Yarmouk River and the Golan where it ends at the baths of Hemma. There, Roman holiday makers sought rejuvenation and vitality from these health-giving hot springs. These are open to modern-day travelers as well. The main hot spring, whose mineral-rich waters are a warm 57ºC, pours into an indoor pool. A number of chalets are also available for rent within the complex. The Hemma facilities have been renovated, and are now available for tourists. For updated information, contact the Ministry of Tourism (tel. 06-4642-311). This strange black city is located about 20 kilometers east of the provincial capital of Mafraq, 87 kilometers from Amman, and only 10 kilometers from the Syrian border. Umm al-Jimal is now known as the Black Oasis because of the black basalt rock from which many of its houses, churches, barracks and forts were built. The precise history of Umm al-Jimal is still unclear, but historians believe that it was built originally by the Nabateans around 2000 years ago. Under the Nabateans, the city played host to a great number of trading caravans. Indeed, the name Umm al-Jimal means "Mother of Camels" in Arabic. The large vacant area in the town center was reserved for traveling caravans stopping in Umm al-Jimal. When the Romans took the city in the first century CE, they incorporated it into the line of defense for Romes Arab possessions. The city lay only six kilometers east of the Via Nova Triana, which connected Romes northern and southern Arabian holdings. Umm al-Jimal may have had as many as 10,000 inhabitants during its heyday. During the third century CE, it seems as though local residents faced some major threat, as they resorted to using tombstones and other available basalt to construct wall fortifications. This wall was then refortified during the fourth century CE. Most of the buildings of Umm al-Jimal were practical and residential in nature, with little evidence of the systematic layout that can be seen, for instance, at Jerash. After surviving a number of catastrophic events including the Persian invasion, plagues, and minor earthquakes, the city was destroyed by a massive earthquake in 747 CE. There are no accommodations in either Mafraq or Umm al-Jimal.